I decided to put my music onto here because it seemed that I just had too many things on my main blog. Some that don't have high speed internet service may have had trouble loading up the page with so much on it. Hope that this is helpful. I will add more music as I find it so check back from time to time to see what's new. I absolutely LOVE violin! I wish I could play but since I can't, I'll just listen and enjoy. Thanks for sharing. I do too and wish that I could play something! My dad could play guitar and mandolin, my brother could play guitar and harmonica, me I can't play anything! I have my brothers Martin guitar and would really like to learn to play it, sigh, someday!!! Is Gilly a Quarter/thoroughbred? Nice mover!! Well Jane..I was just about to LOOK for your music player...I missed the Violin music that reminds me coming here. And THER this was....! thanks for keeping it so I may link and play while I read from you. You do ride well and who in their right mind would even concede to knowing it all?! We don't, and are all in some stage of learning the horse's unique dance! Ahh, the dance of the horse, sadly not many can every master that beautiful waltz; for the rest of us to just do a few steps of the dance is pure joy! small farm girl, thank you! I love this Civil War song. Has an old Irish feel to it. I played violin when I was a child. I wasn't very good, but I did enjoy it. 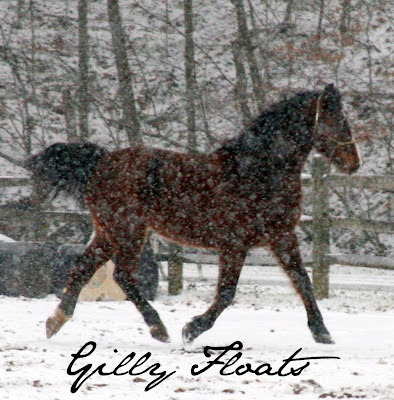 Gilly looks like a Root Beer Float with the snow all round him. hehe! Lisa, yes, that is one of my favorite songs. Wow, neat that you played violin! Bet it was fun! Root Beer Float, that's good, he is root beer colored! LOL Wonder if he'd drink it? He was showing off for Lacy that day! Horse lover, rug hooking artist, amateur photographer - living in southeastern Ohio on a farm with my husband, horse, donkey, 5 dogs and a grumpy cat.